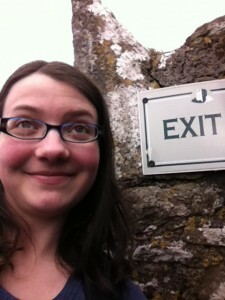 This was a week where I participated in several Irish traditions. It’s a lot of fun to figure out what traditions exist in a particular place, and following them is equally entertaining at times. They occasionally make no sense to us, but then we probably have some pretty weird traditions ourselves in the States. No wearing white after Labor Day? What’s with that? 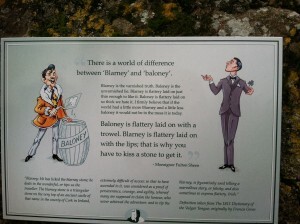 First of all, I took a trip to Cork, and from there I took a bus out to Blarney and kissed the Blarney Stone! It wasn’t very scary to kiss the Stone, I must admit. They used to hang you over the edge of the castle by your heels and you had to kiss it that way, but now they have handrails and a spotter, and there are bars underneath the stone so it’d be rather difficult to fall. It is still pretty high up, though. 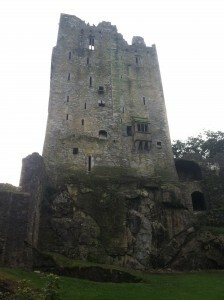 That’s Blarney Castle, and the Stone is all the way at the top. The stairs got very narrow sometimes. I had a backpack with me and I started getting pretty claustrophobic. That was the only worrying thing about the adventure! Second of all, this week was Pancake Tuesday, known in the States as Fat Tuesday or Mardi Gras. But pancakes! Clearly, these are not pancakes as we Americans would understand them. They’re more crepes than pancakes. The mix said ‘Pancake,’ though, which led to my favorite pun of the night, “These pancakes are full of crepe.” Thank you, I thought I was hilarious. The tradition arose because people had to use up all of their eggs and butter, all ‘luxuries,’ before Lent. I guess people don’t get to eat anything fun over Lent, so they’d use all their extra goods up making pancakes the day before Ash Wednesday! 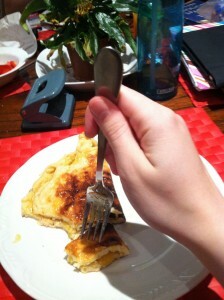 That isn’t actually my pancake, by the way. 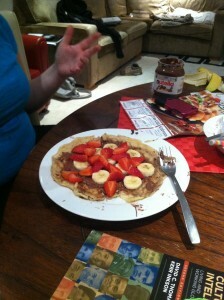 My friend Julia made a prettier pancake than I did. Mine just had a lot of lemon curd in it. 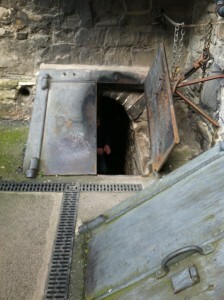 This is probably one of the coolest things I’ve done in Dublin. 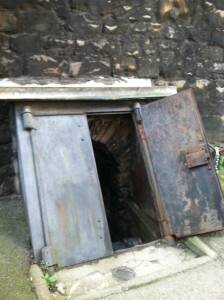 There were lights on down there, it was fairly roomy even though we were a big group, and there were mummies! Dublin mummies, two women and two men. One of the men was a Crusader, over 800 years old, and I participated in my third traditional practice when I TOUCHED HIS HAND. It felt like petrified wood and it’s supposed to bring good luck. I can’t stop thinking “I TOUCHED A MUMMY,” though. A once-in-a-lifetime experience, that. Just like with blood pudding, as long as I didn’t think about what I was doing, I wasn’t going to freak out. Our tour guide was fantastic, too, and he may now remember me as “that quantum physics expert from Washington,” which is just a wonderful (incorrect) impression to make on someone. He knew some good history. Some of the crypts are still ‘active,’ which means that members of a certain family can be buried there if they want. Theobald Wolfe Tone’s death mask is in one of the crypts, too, which strangely was not advertised considering how much they love Wolfe Tone in this town. So it was an exciting week for me! Blarney, pancakes, and mummies, oh my! You can have a lot of fun (and some great stories to tell) if you join in on local traditions!